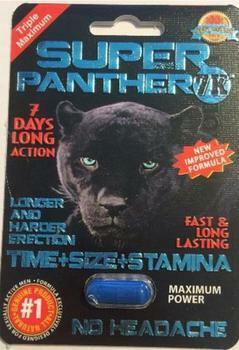 Ultra Shop Supplement is recalling Super Panther 7K capsules, marketed as a dietary supplement for sexual enhancement. Samples of the product were found to be tainted with undeclared sildenafil and tadalafil, active ingredients in two FDA-approved prescription drug products used to treat erectile dysfunction (ED). The presence of sildenafil and tadalafil in Super Panther 7K renders it an unapproved drug for which safety and efficacy have not been established and, therefore subject to recall. The recalled product is packaged in Super Panther 7K capsules, 6-count bottles UPC 6 01577 51320 9, Exp 8/28/2020 lot RO246852 1-count blister cards UPC 6 015577 51324 7, and 30-count hanging card display UPC 015577 51324 7, and lot RO846356, Exp 08/28/2020. The product was was sold to consumers in the U.S. through the firm's retail website. Customers who purchased the recalled product should stop using it immediately and contact the firm at 888-246-9664 Monday-Friday from 9:00 am – 5:00 pm (ET) and ask to return the recalled products.